Febreeze coupon is to buy one get one free. 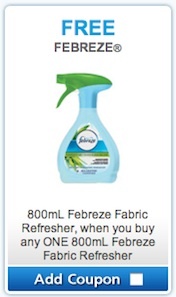 You can find this Febreeze coupon on Brandsaver.ca’s website. Their coupons change every month, so claim your coupons soon. They haven’t updated the coupons for August yet. Brandsaver coupons take about 3-4 weeks to arrive, so I suggest to select as many coupons as you can (max 32) so you’ll be ready when you need to use the coupons. 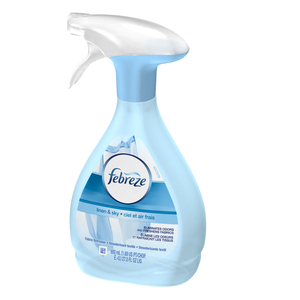 Febreeze coupon is get a Free Febreeze 800mL Febreeze Fabric Refresher, when you buy any one 800 mL Febreeze Fabric Refresher. Refresh it! to keep fabrics fresh and odor-free. Original Febreeze extra-strength formula eliminates tough household odors and leaves the sparkling scent of a freshly cleaned home.